greater risk of suicide and self-harm than any other patient population. Safety is a primary concern of therapies used in any psychiatric facility. 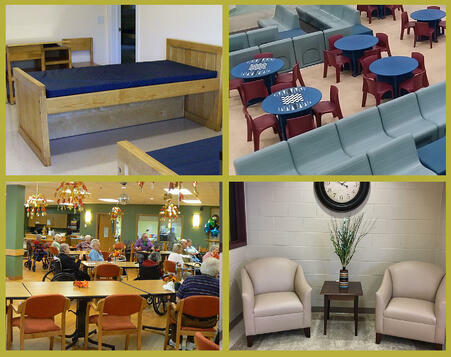 Behavioral healthcare furniture is important to managing risk appropriately to protect patients, visitors and staff. Furniture and components can be used as a weapon or a source of hanging or self-harm therefore, the right furniture that is designed specifically for behavioral healthcare and psychiatric environments is crucial to successful therapies and treatments. Residential style furniture is typically first choice in behavioral healthcare facilities because feeling like “home” provides therapeutic support through offering patients a comfortable environment where they will be more willing to participate in healing. Since programs often require stays of 5 days or more, patients need to feel comfortable in their surroundings and allow themselves to settle in to their treatment facility as if it were their home. Sterile, institution-like furnishings can be a distraction to patients and can prevent healing. From the standpoint of safety, eliminating furniture and fixtures that can be broken in to shards that can be used as weapons, preventing contraband and preventing places that could be used for hanging are tall orders but necessary for the best patient results. Use upholstery fabrics that are durable and can be easily cleaned. When selecting upholstery fabrics, look for criteria such as Wyzenbeek “double rubs” that indicate how fabrics behaved in controlled laboratory studies. Fabrics rating 15,000 double rubs or more are considered contract quality and 30,000 double rubs or more is considered highly durable and will be suitable for most heavy use environments. Fluid-resistant, anti-fungal and anti-microbial properties are offered through contract furniture distributors and manufacturers and have many benefits related to managing incontinence, body fluids and spills. Crate style wood frame furniture is heavy-duty upholstered furniture that simultaneously offers durability and comfort. Crate style lounge seating is aesthetically appealing can hold up to lots of use including adolescents or groups that challenge traditional furniture. Additionally, create style furniture has cushions that are easily changed to keep current with design trends or just to freshen up an aging look. Anti-contraband bedroom furniture allows patients or residents to have private time while allowing staff easy inspection for contraband items. Open shelving also prevents small, breakable parts like drawer boxes, drawer fronts and hardware. Taller storage cabinets or wardrobes can have sloped tops to prevent both contraband and places that could be used for hanging or self-mutilation. Molded plastic furniture and acrylic mirrors are single-part pieces that do not have any hardware that can be removed. Molded plastic lounge chairs, beds, desks and tables are available with bolt-down options that can secure furniture to the floor. Molded plastic bedroom furniture is not only able to handle high levels of use and abuse, but molded plastic furniture has fewer crevices so it can be trusted to help reduce bed bug concerns. It can be easily cleaned to remove pesticides or fluids. Outdoor furniture is an excellent way to turn outdoor space into part of the therapeutic environment through turning green space into classroom, group therapy or dining space. Heavy-duty steel benches and tables resist fading ad rusting and can be bolted down on concrete pads. All weather outdoor furniture can be left outside even during snow and ice and will be rust-free for summer. When considering new furniture for your behavioral healthcare or psychiatric facility, make sure to consult with a furniture provider that understand that needs of your consumers and staff.